￼ To stay safe on the Internet, we must avoid getting infected by malware. Your anti-virus program can usually catch the malware once it hits your computer, but it is much safer to not download the infection. 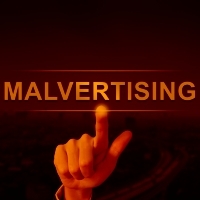 When malware attacks you through advertising on legitimate sites, it is called malvertising. Many people don't realize how dangerous advertising is. 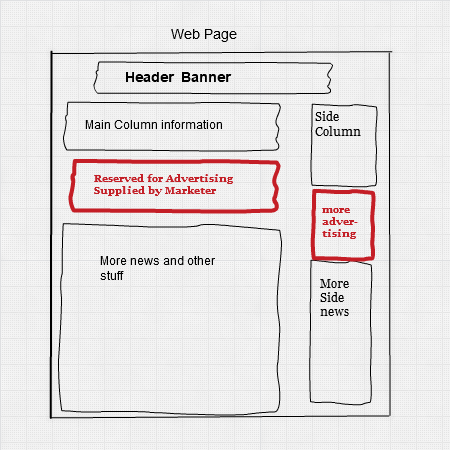 Websites mark out parts of their pages for marketing companies to fill in with their ads. ￼As shown above, sections of web pages are marked for advertisements of the appropriate size. Those ads come from thousands of different sources, some of which are miscreant malware authors. Sometimes negligent marketers have infected computers. There are no penalties for pushing out malware infected advertising, so websites and marketing companies do not spend the money necessary to ensure that the millions of advertisements in their pool are safe. Security experts have trouble finding the specific causes of the malware because the advertisements constantly change. The ad may appear for one visitor, but not for the next 50. These attacks are so prevalent that a single malware attack targeting iOS devices hijacked 300 million browser sessions in just the first 48 hours last November. These attacks appear on all websites who monetize with advertisements, unless the site owner sells and qualifies all the ads themselves, a practice seldom done. So, you are not safe on say, the New York Times, or BBC, or NBC. I always install advertising protection on my clients' computers. For many years, I've installed an ad-blocker on their browser, or recommended Cliqz or Brave which come with their own excellent built-in ad-blocker. Many of my clients also use anti-tracking either built-in with Brave and Cliqz or added with Privacy Badger. Adblock Plus - Has extensions for Safari, Chrome based and Firefox based browsers.